Dubai The DSF launch ceremony has been cancelled as a mark of solidarity to the people of Gaza. This was announced yesterday Monday by Sheikh Ahmed bin Saeed Al Maktoum, chairman of the Dubai Shopping Festival Office (DSFO) Supreme Committee. The dicission of cencellation was on the directive by Dubai’s ruler HH Sheikh Mohammed bin Rashid Al Maktoum, who also cancelled all New Year’s Eve outdoor celebrations in the emirate in viw of the Palatanians killings in Gaza bY Israel. However Sheikh Ahmed OF Dubai Shopping Festival Office (DSFO) added that all other DSF 2009 activities would go on as planned from Jan. 15 to Feb. 15 2009. The 32-day event promises some of the best shopping discounts in a DSF edition yet and prizes worth millions of dirhams will be given to shoppers every day. Ministry of Culture, Youth and Community Development will celebrate the UAE National Day with special activities. Under the gidance of of His Excellency Abdul Rahman bin Mohammed Al Owais, Minister of Culture and Youth and Community Development ministry has organised two exhibitions at Art Studio whilch are “Dream of Persia” exhibition and “Arab Emirates Eyes”, which will will remain open till the end of December. The world’s largest and record breaking Fireworks Display will light up Abu Dhabi’s night sky also on 2nd December being an events organised by the Emirates Palace to celebrate the 37th National Day of UAE. The fireworks will begin at 08.30pm lasting for 45 minutes, and will be visible along the Abu Dhabi Corniche and across the Emirates Palace Hotel Marina. The hotel has also announced a breathtaking colourful line up of entertaining cultural, musical and artistic events in celebration of the UAE’s 37th National Day. On the eve of National Day, 1st December, a unique laser show will light up the night sky commencing at 6.00pm. The show will run every evening until 3rd December. Recognising the enduring achievements of the founding father of the nation the late Sheikh Zayed Bin Sultan Al Nahyan, The Emirates Palace’s Dome will be hosting an exclusive public showing of an original painting of Sheikh Zayed by Roland Van Merbeck. The work will be on display until 4th Dec.
Time to Shine Abu Dhabi Vision to Reality painting and photography exhibition will be staged from 30th November through 4th December. International contributions from globally renowned artists will be showcased. Taking the essence of the glorious day, the Emirates Palace will be displaying UAE’s biggest Greeting Card, a 7.5 meter high Card in the Dome. The Greeting Card will offer both guests and visitors the opportunity to add their special greetings message to the card to celebrate this special UAE National Day. Abu Dhabi Arts Culture and Heritage (ADACH) will be organizing a series of national concerts in the West Park over the period 2nd to 4th December, featuring celebrated artists such as Mohammed Abdo, Elissa, Hussain al Jasmy and Ahlam together with some of the most popular Arabic singers. The event is open for public. Exoticdubai.com the most trusted and dynamic web site of Dubai travel and tourism wins the UAE awad from oer a 1000 web sites reviews by a Jury comprising a group of Design and Technical professors specialists in different fields. 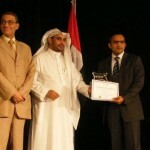 The Award was prestented in a lavish ceramoney in Dubai at Jumeirah Beach Hotel Safina Ballroom on 29th Novembe 2008. “We are pleased and thankful to Pan Arab Web Awards fore chosing us to be one of the prestigious winners” said Mr. Suhail Agha while receiving the awar. UAE Web Awards was created to recognize excellence in web design and development skills. to showcase their creativity in a competition for the best website in UAE .